The ELEAGUE Major: Boston will begin with Valve’s The New Challengers stage (formerly the “Major Qualifier”), Friday-Monday, Jan. 12-15, beginning each day at 10 a.m. ET with live coverage presented on Twitch from ELEAGUE Arena in Atlanta. Additionally, select matches will be available on ELEAGUE’s Game Command, an innovative mosaic video player that allows the user to choose from thousands of CS:GO viewing combinations. The New Challengers stage will feature the eight Minor Champions and Runners Up – Renegades and TyLoo from Asia; Avangar and QB Fire from CIS; Space Soldiers and EnVyUs from Europe; and, Misfits and Team Liquid from the Americas – competing against the bottom eight finishers from the previous Major: Cloud9, FaZe Clan, G2 Esports, Natus Vincere, Mousesports, Sprout (formerly Seed), FlipSid3 Tactics and Vega Squadron. Live The ELEAGUE Major: Boston action will continue with Valve’s The New Legends stage (formerly the “Group Stage”), Friday-Monday, Jan. 19-22, beginning each day at 10 a.m. with live coverage presented on Twitch from ELEAGUE Arena in Atlanta. The New Legends stage will pit the eight new Challenger teams against the top eight finishers from the previous Major: Gambit Esports, 100 Thieves (formerly Immortals), Astralis, Virtus.pro, North, BIG, SK Gaming and Fnatic. The eight new Legend teams to emerge will compete at Agganis Arena in Boston, Jan. 26-28, during The New Champions stage (formerly the “Playoffs”). Live Twitch coverage of The New Champions stage will begin at 10 a.m. on Friday and Saturday, Jan. 26-27, while live coverage of the event’s final day will begin at Noon on Sunday, Jan. 28. In addition to live event coverage, ELEAGUE will take fans on an all-access journey with tournament favorites and hopefuls as they pursue The ELEAGUE Major: Boston trophy. The series will air for five consecutive Fridays on TBS, ­­premiering Friday, Feb. 9. 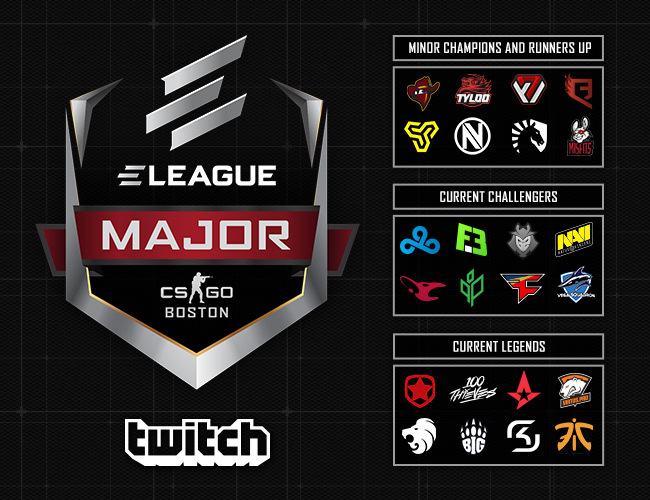 Viewers will get to know superstar players and relative unknowns from the boot camp preparation phase through the Grand Final, as they seek CS:GO glory at The ELEAGUE Major: Boston. The ELEAGUE Major: Boston will ignite the passion of CS:GO fans around the world as it infiltrates Boston’s Agganis Arena, Jan. 26-28, with ticketed guests receiving an RFID-enabled badge. For the first time, attendees will become eligible to receive souvenir drops (randomly awarded in-game items) by linking their Steam accounts to their RFID badges. The badges will also make arena entry and re-entry simple, as well as unlock themed in-arena experiences. Three-day tickets are available at ELEAGUE.com/major, where fans can also find Boston hotel and visitor information. Media members interested in covering any stage of The ELEAGUE Major: Boston can submit a credential request using this link.